In 2012, I had the pleasure of delivering the GWPF annual lecture at the Royal Society. 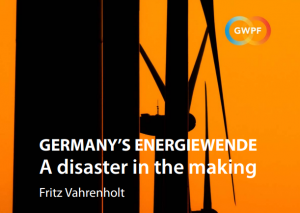 I described the Energiewende of the German government – its plan to transition to a low-carbon energy supply – in the aftermath of the tsunami catastrophe at Fukushima. At that time, Germany’s conservative/liberal government had decided to dismantle 19 nuclear power stations by 2022, despite them supplying nearly 30% of the country’s electrical power production. They were to be replaced with renewable energy. This was, for energy experts, a daunting task: to substitute a cheap, reliable, secure electricity supply with expensive, unreliable, intermittent renewable power. But under the influence of the IPCC circus – Copenhagen, Cancun, Doha, Bali, Lima, Durban, Paris, Marrakech – and the strong demands of German society, media and politicians, Germany’s government wanted to be in the vanguard of those combatting man-made climate change. They had set the next target of the Energiewende : to get rid of fossil fuels in power, heating and transport as well. Under its current decarbonization plans, Berlin aims to ultimately increase the share of renewables to between 80 and 95% of total energy supply by 2050. No other country in the world is following such a radical course. China will grow their carbon dioxide emissions above today’s 29% share of the global total until 2035. That is, in essence, their ‘deal’ with President Obama and their ‘commitment’ in Paris.